The Lower East Side is getting a new golden gateway with its first gold brick building at 196 Orchard Street. Located between East Houston and Stanton Streets, Magnum Real Estate partnered with Real Estate Equities Corporation for its latest offering of an 11-story, 94-unit residential condo that offers studios to four-beds. 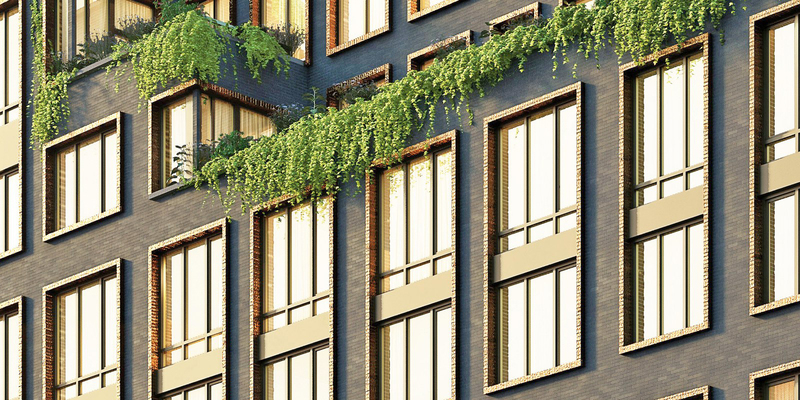 To set itself apart from the new developments coming to Manhattan, Magnum decided to use a bronze glazed brick that is speckled with gold dust for the first two floors and surrounding the casement windows. The rest of the building is constructed with black diamond brick and each and every brick is laid by hand, according to Magnum. The gold bricks are sourced from a Spanish fishing village called Cadaqués where the handmade brick manufacturer, Cerámica La Covadonga, has been perfecting the craft for more than 100 years. The building won’t be hard to spot as the golden bricks will shimmer in the sunlight and develop a stronger luster over time, according to Jordan Brill, a partner at Magnum Real Estate. To match the artsy culture of the Lower East Side, 196 Orchard offers a little flare with its gold brick, but features an interior design of muted and darker tones. It is one of the latest in a number of luxury developments coming to lower Manhattan, alongside the new buildings at Essex Crossing, the group of ultraluxuries at Two Bridges and others in the neighborhood’s side streets. But Brill said 196 Orchard offers value in its design and amenities where others do not. Studios will cost at least $985,000, one-bedrooms start at $1.3 million, 2-beds pricing begins at $2.195 million, 3-beds are at least $4.2 million and the 4-beds start at $5.875 million. Residents enter through the Orchard Street entrance adorned with a bronze marque into a lobby constructed from matching materials and finishes found in the residences. The front-desk is staffed by a 24-hour concierge with bike storage and offers private storage space for an additional cost. The units feature custom kitchens designed by Incorporated Architecture and Design with Miele appliances, black quartz countertops, kitchen islands and a wine cooler. And the bathrooms that are wrapped in marble come with stainless steel finishes, walnut vanities and white quartz countertops. For those looking for outdoor space, 196 Orchard also features a 4,100 s/f rooftop terrace. Residents can take in the views of different neighborhoods in New York City while hosting their friends for a barbecue alongside a wet bar or just relax in the turfed area’s lounge chairs. The rooftop also features two outdoor kitchens, a chef’s table, and picnic tables. But for residents looking for a more intimate outdoor area, some residences feature private terraces and courtyards, with the largest being more than 1,600 s/f. The building was also constructed with a 30,000 s/f Equinox fitness club with traditional gym space, a juice bar, and a spa on the second and third floors where residents have access to a private entry. Despite being a new development, 196 Orchard was designed to pay homage to the culture and vibe of the Lower East Side. In fact, Magnum even purchased air rights from the adjacent renowned deli, Katz’s, in order to construct the property. In 2014, the owner of the deli known for its Pastrami sandwiches confirmed that it sold its air rights to a developer so that it could remain on the corner of East Houston and Ludlow Streets. As a new building in the Lower East Side, Brill said that 196 Orchard fits right into the existing lifestyle of the neighborhood. But the firm also expecting its new project to be representive of the next wave of progress for the Lower East Side. Construction is finishing up and expected to be complete by early 2019 with move-ins already underway. Magnum expects full occupancy by the end of the year.